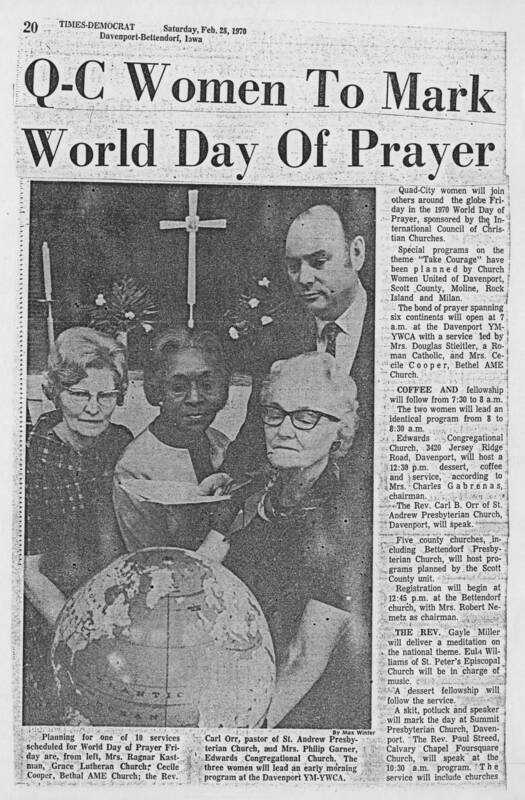 DIY History | Transcribe | Social Justice | Cecile Cooper newspaper clippings, 1964-1998 | 1970-02-28 Article: ""Q-C Women To Mark World Day Of Prayer""
1970-02-28 Article: ""Q-C Women To Mark World Day Of Prayer""
Q-C Women To Mark World Day Of Prayer Quad-City women will join others around the globe Friday in the 1970 World Day of Prayer, sponsored by the International Council of Christian Churches. Special Programs on the theme "Take Courage" have been planned by Church Women United of Davenport, Scott County, Moline, Rock Island, and Milan. The bond of prayer spanning six continents will open at 7 a.m. at the Davenport YM-YWCA with a service led by Mrs. Douglas Stieltler, a Roman Catholic, and Mrs. Cecile Cooper, Bethel AME Church. Coffee and fellowship will follow from 7:30 to 8 a.m. The two women will lead an identical program from 8 to 8:30 a.m. Edwards Congregational Church, 3420 Jersey Ridge Road, Davenport, will host a 12:30 p.m. dessert, coffee, and service, according to Mrs. Charles Gabrenas, chairman. The Rev. Carl B. Orr of St. Andrew Presbyterian Church, Davenport, will speak. Five county churches, including Bettendorf Presbyterian Church will host programs planned by the Scott County unit. Registration will begin at 12:45 p.m. at the Bettendorf church, with Mrs. Robert Nemetz as chairman. The Rev. Gayle Miller will deliver a meditation on the national theme. Eula Williams of St. Peter's Episcopal Church will be in charge of music. A skit, potluck and speaker will mark the day at Summit Presbyterian Church, Davenport. The Rev. Paul Streed, Calvary Chapel Foursquare Church, will speak at the 10:30 a.m. program. The service will include planning for one of the 10 services scheduled for World Day of Prayer Friday are, from left, Mrs. Ragnar Kastman, Grace Lutheran Church; Cecile Cooper, Bethel AME Church; Rev. Carl Orr, pastor of St. Andrew Presbyterian Church, and Mrs. Phillip Garner, Edwards Congregational Church. The three women will lead an early morning program at the Davenport at the Davenport YM-YWCA.